ALPENA, Mich. – He's done it all. Or more accurately, he's nearly done it all. He being Kevin VanDam, arguably the greatest professional bass fisherman of all time. And the all being the winning of virtually every major bass fishing title that the sport has to offer. With the exception, of course, of winning a Jack Link's Major League Fishing title. Which leaves KVD gunning for the 2014 General Tire Summit Cup as competition in Alpena, Mich., draws to a conclusion. How badly does VanDam want to win this title? About as badly as Peyton Manning and the Denver Broncos would like a do-over in the 2014 Super Bowl. "I'd love to do it," said VanDam of winning in Alpena. "That's why we're all here." While it is true that there are five other anglers in the championship finale, VanDam has looked very much like a man on a mission during the event, literally blowing away the competition in each of his previous two rounds. But he insists, he isn’t counting any chickens before they hatch. Even if those chickens happen to be northern Michigan smallmouth fisheries that appear to be very much in KVD's angling wheelhouse. "This is going to be one of those days where you can make a big run late," said VanDam, the four-time Bassmasters Classic champ with 20 B.A.S.S. wins to his credit. "I think you'll see that, just like every other day. We've got a little cloud cover and that will make them tough to see, but you can get on them and really do a lot of damage in a hurry." VanDam has certainly done that, repeatedly putting on a virtual how-to clinic in front of Outdoor Channel's television cameras as they record the action in the shadow of Lake Huron. Despite going to a new fishery yet again - Grand Lake is the third fishery the MLF pros have competed on at this event - KVD is confident that he has the region's smallmouth dialed in. "Even if it doesn't start off great for me, I know in my mind that I'm going to find them out here," said VanDam, a seven-time B.A.S.S. Angler of the Year and the 2001 FLW Angler of the Year. "When I do, it's going to make it easy to duplicate. Hopefully, I can get off to a strong start and go." While he is confident in his abilities on these Pure Michigan waters, KVD isn't completely ready to alert the engraver to etch his name on the Summit Cup. "These guys are all really good anglers," said VanDam, the winner of nearly $6 million dollars in career earnings. "They know what's going on and how to fish." But obviously, as the 800-pound gorilla in the room, so does VanDam. 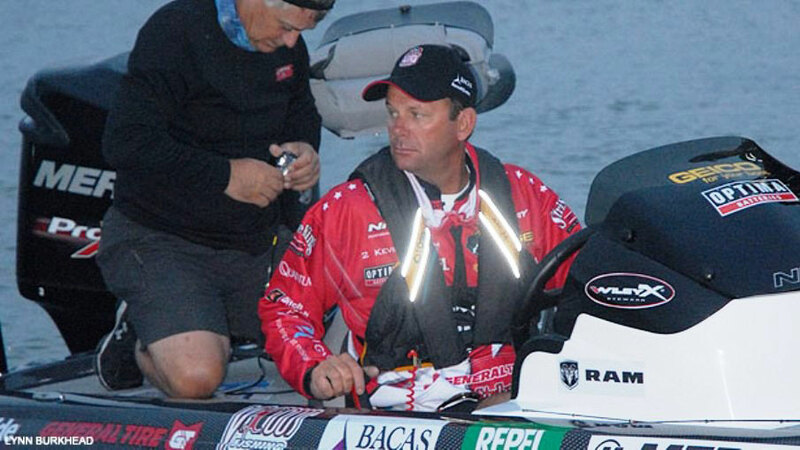 And after getting his first glance at a map of Grand Lake on the morning of the final via his boat electronics, KVD was all smiles as he formulated a game plan for the day. "(This) lake really sets up well for my style," he said. Which has been KVD's trademark power-fishing methods centered upon the throwing of reaction baits like a jerkbait and a spinnerbait. "As long as the wind is blowing at all, I'm sure that I can catch them today on the reaction baits," said VanDam, an angler with a staggering 107 Top-10 finishes on his resume. "I'm sure going to fish that way until I find them. While power methods are his preferred way of fishing, VanDam says he will not hesitate to pick up other rods in the boat if more subtle presentations become necessary. "In smallmouth fishing, you always want to have that one-two punch," he said. "You want a mix of power and then finesse. That's how you can really maximize numbers off of a spot. "A lot of times they show themselves with a crankbait, a jerkbait, or something like that. And then you can throw a drop-shot or a tube in there and (really) work on them. "We'll see; I'll have everything ready to go. Yesterday (in Sudden Death), I never had to pick up a finesse bait. The first day, I did (though) and I always have one there (that is) ready." Just like Aaron Martens will, one of KVD's biggest rivals in pro fishing. The same goes for Brent Ehrler, the man that kept KVD from winning the 2012 Challenge Cup at Lake Amistad in the inaugural MLF event held in Texas. And ditto, of course, for Shaw Grigsby, Greg Hackney and Timmy Horton, all extremely capable anglers who hope to keep KVD from winning the Summit Cup in his Michigan backyard. Will KVD be looking to send any messages to the field by way of the real-time leaderboard? "I'm not going to really say anything to those guys at all," said VanDam. "In the end, we're all competing against ourselves and trying to figure out the fish. "Even though you have the leaderboard (in MLF) and it's the closest you'll ever get (in this sport) to saying 'Hey, I'm going after him' or whatever, it's really not the person, it's the fish that you've got to catch to make it happen." That being said, he is hoping to make the field sit up and take notice of a good start in this round. Especially in light of the fact that VanDam got off to a bit of a slow start in the Sudden Death Semifinal Round, giving the field a brief window of hope and opportunity. Still, KVD wasn't second guessing himself in that round. Nor does he figure to do so in the championship shoot-out. "I made my decision (about what to do) pretty quick yesterday on what I thought I needed to look for," said VanDam. "It took me two stops to come in contact with the fish. I'm going to do the same thing today." Why not? Because after KVD's virtuoso performances in the first two rounds, there is no need to fix something if it isn't broken. "I know what I need to do," said VanDam. "I know what fish up here relate to and like based on the type of lake (that we've been fishing). "We'll get an idea for that in a minute in our ride-along. And sooner or later, I know I'm going to run into them here. This is a lake that's got a lot of options and it's a big lake and they've got a lot of places they can be." Which at this event, has most often been at the end of KVD's line. "It's just going to be a matter of elimination," said VanDam with a smile. And with that, KVD turned to his boat and continued preparations to launch onto the waters of Grand Lake for the Summit Cup's Championship Round. Where VanDam aims to quickly eliminate the competition from having any serious chances to win the coveted MLF trophy up for grabs. All in hopes of filling the only real hole that remains on KVD's best-of-all-time pro bass fishing resume.